Scotland’s dedicated network of cycle routes has a great range of paths and trails to suit all abilities, showcasing why one of the best ways to explore Scotland is on two wheels. 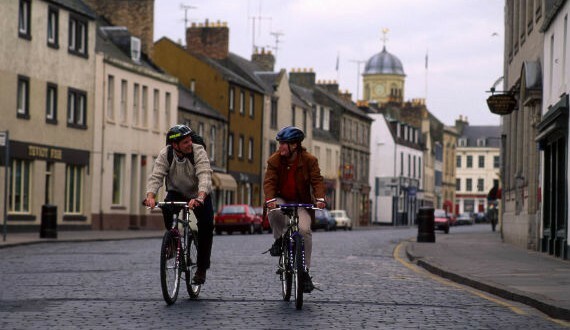 Follow the country’s designated (NCN), which covers over 1,500 miles of Scotland. From traffic-free paths running through city centres, to quiet country trails and waymarked canal and railway paths, the network includes some of Scotland’s most spectacular scenery and . The 33-mile stretch between in the on National Route 7, and the 14-mile, mainly traffic-free part of National Route 1 on the Moray coast are just two of the NCN sections which are achievable in one day. If you’re feeling more adventurous, why not enjoy a cycling holiday and take your time to explore the longer routes throughout Scotland? Book a place for you and your bike on the ferry and hop across to the and , to explore the diverse landscape, taking in the rolling southern countryside and the mountainous north. Route 1 stretches from with England, up the east coast to . Split into three large sections in Scotland, including and , Route 1 offers a great mix of challenging and more manageable cycle paths and trails. Scotland’s most northerly section of Route 1 is the 109-mile stretch on , between Sumburgh Head and Nor Wick Bay. It’s not for the faint hearted, due to many challenging island routes, but cyclists will be rewarded with spectacular scenery throughout. Whatever your cycling ability, there is a guaranteed National Cycle Network route in Scotland for you. Check out the website and download the for more information.